"Gabriella, there are several different ways to freeze corn. Of course, everyone ... read full review"
Corn is a tall cereal plant consisting of strong jointed stems supporting large ears containing kernels. Out of the different types of corn grown, sweet corn is one of the most popular varieties for human consumption. Sweet corn is a good source of vitamin A, magnesium, and potassium, and is often considered to be a vegetable, rather than a grain. This confusion is probably due to the fact that it is eaten fresh like a vegetable. When harvested at the proper ripeness, the kernels of sweet corn are tender and have a sweet, juicy taste. The three types of sweet corn that are readily available are white corn (white kernels), yellow corn (yellow kernels), and a hybrid of both white and yellow, often referred to as peaches and cream or butter and sugar corn. Sweet corn can be processed into syrup, sugars used as sweeteners in soft drinks, starch, and cereals. 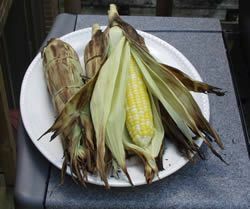 During the summer months when it is available fresh, it is most often cooked and eaten on the cob. Sweet corn is also cut off the cob and eaten as a vegetable side dish or added as an ingredient to other dishes, such as soups, stews, casseroles, and salads. 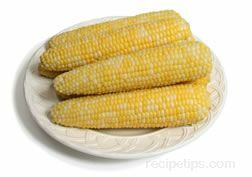 The corn can be cut from the cob, raw or cooked, and then preserved by canning or freezing for future use. Sweet corn is at its best during the late summer months to early fall. An exception to that is in Florida where sweet corn is harvested from fall to spring. 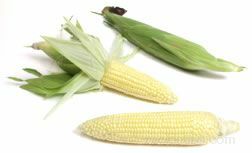 To receive the best flavor from sweet corn, it should be eaten as soon as possible after it is picked because the sugars will begin to convert to starches as soon as it has been picked. When selecting, look for husks that have good green coloring with pale colored silk. 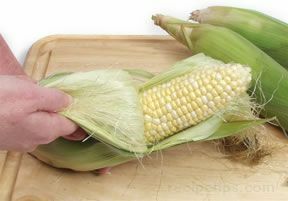 To check the freshness, pull the top of the husk away from the ear and pierce a kernel with your fingernail. If the kernel releases a slightly cloudy juice it is typically a fresh batch. If the kernels are dented or discolored, the corn is not fresh. 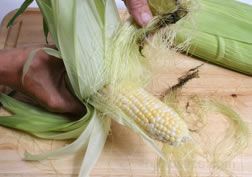 Avoid sweet corn with dried or dark colored silk or discolored husks. Buying sweet corn from a road side stand may result in corn that has lost much of its sweetness from being exposed to high temperatures. The high temperatures will rapidly convert the corns sugar to starch, causing it to lose some of its sweet flavor. 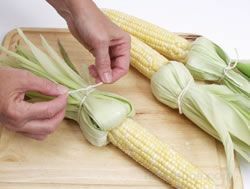 To store corn, leave the corn in the husk and refrigerate as soon as possible. 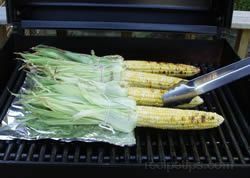 If corn has been husked, place it in a plastic bag and store in the refrigerator. It is best to eat it as soon as possible. Corn cut off the cob can be frozen for 6 months to a year. The largest portion of the different varieties of sweet corn are yellow sweet corn. All the kernels on the cob are yellow in color. The size of the cob and the corn's taste will vary between different varieties. Most commercially grown sweet corn is yellow. White sweet corn varies from the others in that it has all white kernels. Its flavor is not as sweet as the yellow corn and the peaches and cream corn. It is used in the same manner as yellow corn. White sweet corn is not generally grown for commercial use. It is more often found at local markets. Peaches and Cream corn, also referred to as butter and sugar, differ from the other varieties in that it contains both white and yellow kernels. White and yellow kernel sweet corn is not generally grown for commercial use. It is more often found at local markets. 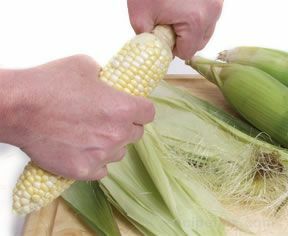 Shuck the corn by peeling back the husk and completely removing it. Break or cut off any remaining corn stalk. The corn is now ready to cook. 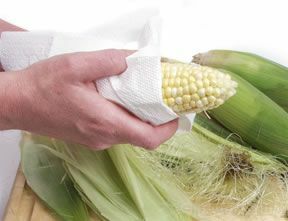 Tip: Remove silk when shucking corn by using a damp paper towel for collecting the silk. 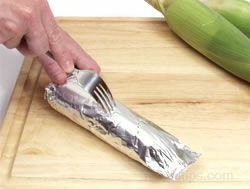 Moisten the paper towel and hold the towel against the cob, moving the towel down the cob and allowing the silk to stick to the towel. 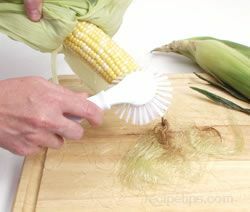 This method works well for removing small strands of silk that often adhere to the cob after the leaves are removed. This method protects the kernels by not having to use other methods of removal that cause damage. 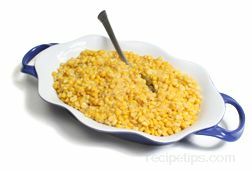 The sweet corn kernels can be removed from the cob and cooked as a side dish or added as in ingredient in other dishes. The kernels are also cut off the cob to be canned or frozen so they can be stored for future use. 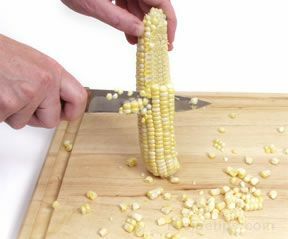 Remove kernels by standing the ear of corn upright on a cutting board. 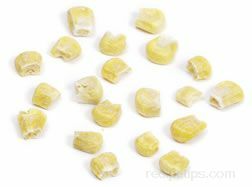 Using a sharp utility or chef's knife, cut the kernels straight down along the corn cob to free numerous rows of kernels at the same time. The most popular way to eat sweet corn is on the cob. 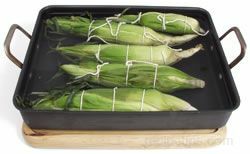 It is generally husked before cooking but can be cooked using methods that call for the husks to be left on. 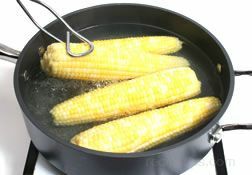 When boiling sweet corn, avoid adding salt to the water because it will cause the corn to toughen when it cooks. Also, it is important to cook the corn only until it is tender. 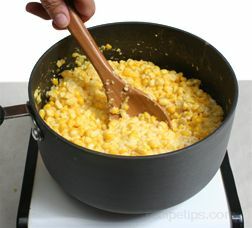 Overcooking will cause the corn to lose its sweet flavor and will cause the kernels to become tough. The instructions below show several methods that can be used for cooking corn on the cob. 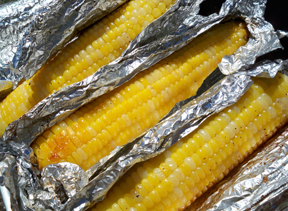 This method works well when cooking larger quantities of corn on the cob. 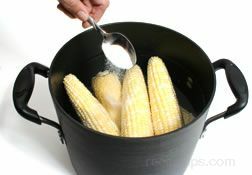 Place shucked corn into a large pot and cover with cold water. 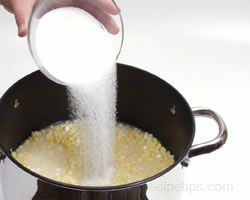 Add a tablespoon of sugar to keep corn sweet and tender. Cook corn over high heat and when water comes to a rapid boil, the corn is done. Do not overcook. Remove from the heat, drain, and serve. 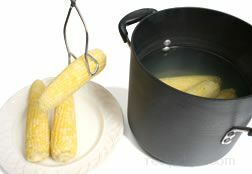 Corn can stand in the hot water (away from heat) for 5 or 10 minutes. This method also works well when cooking larger quantities of corn on the cob. 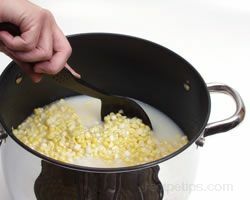 Add enough water to a large pot to cover corn when it is added. 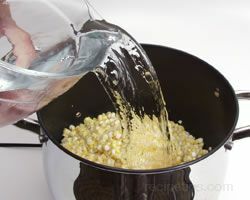 Be sure you do not add too much so that the water overflows when the corn is added. Add a tablespoon of sugar if desired. 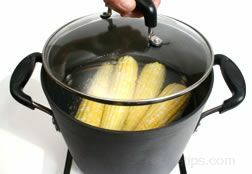 Bring the water to a full boil and then add the corn to the water. Allow the water to come back to a boil and then cover and turn off the heat. 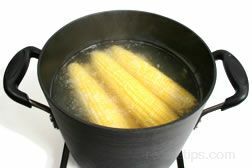 Allow the corn to stand in the hot water for 5 to 7 minutes. Do not overcook. 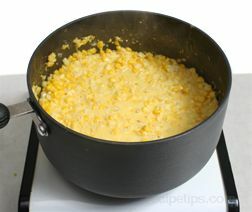 Remove finished corn from the cooking water and serve while warm. 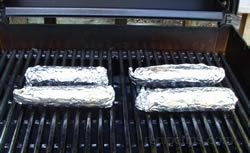 This method works best when cooking smaller quantities of corn on the cob. Place water in a deep skillet. Add at least an inch of water but do not add too much that the water will overflow when corn is added. Add approximately 1/2 tablespoon of sugar to the water. Do not add salt. Bring the water to a boil. 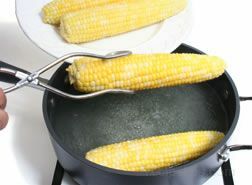 Place shucked corn into the skillet. The corn does not have to be completely covered. 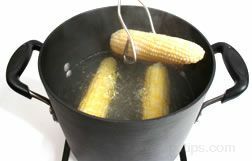 Allow the water to come back to a boil and then cook the corn for 5 to 7 minutes, depending on desired tenderness. Turn once half way through cooking time. Do not overcook. 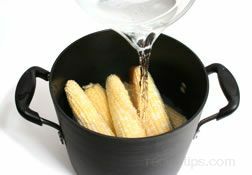 Remove corn from the cooking water and serve while warm. 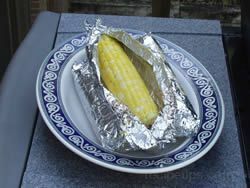 Microwaving corn on the cob is a quick simple method to use when cooking only a few ears of corn. The cooking time will vary slightly depending on the strength of the microwave. 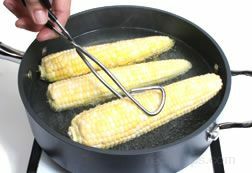 Microwaving eliminates the time necessary to boil the water for cooking the corn on the stove top but if microwaving more than 3 or 4 ears, it may be just as fast to use one of the boiling methods. Pull back the husks about three quarters of the way down the ear and then remove the silk. After the silk is removed, pull the husks back up around the ears. 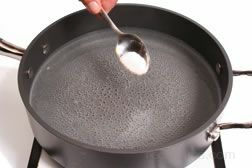 Place the ears in a pan of water and allow to soak for 20 to 30 minutes. Place wet corn on a paper towel in the microwave. Microwave on high from 3 to 5 minutes. Turn cobs and microwave an additional 3 to 5 minutes, depending on desired tenderness. After the corn is done cooking in the microwave, remove the ears and allow to stand for 1 minute before serving. 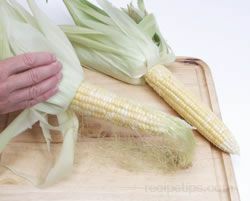 When ready to serve, remove the husks from the ears of corn. Husks should be easy to remove. Serve with butter and favorite seasoning. 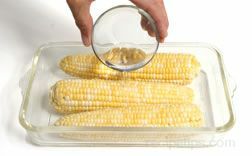 Place husked ears of corn in a baking dish that is microwave safe and add some water, approximately 2 to 3 tablespoons. Cover ears of corn tightly with plastic wrap. Microwave for 6 minutes and then remove from the oven. Pull back the plastic wrap, being careful of any steam escaping, and then turn ears over. 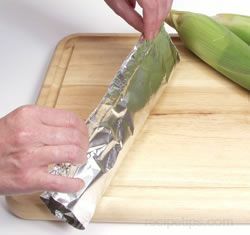 Replace the plastic wrap and return the corn to the microwave to cook for an additional 5 minutes. When done, allow corn to stand in the microwave for 2 or 3 minutes. Remove from the microwave and carefully remove the plastic wrap. 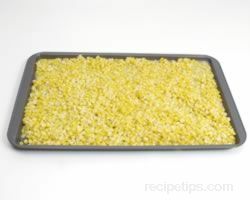 Remove the corn from the baking dish and serve while warm. 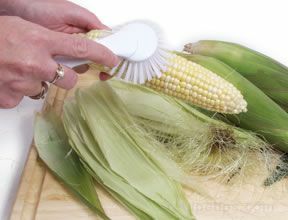 Rinse ears of shucked corn and wrap each ear in a damp paper towel or wax paper. Microwave on high for 3 or 4 minutes. 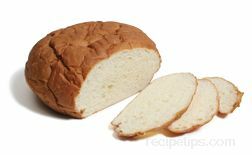 Turn cobs and microwave for an additional 3 to 4 minutes, depending on desired tenderness. When the corn is done, allow it to stand for 1 minute before eating. 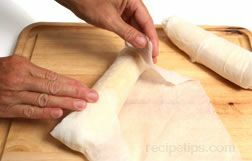 Remove the paper towels or wax paper and serve while warm. Creamed corn is another way to enjoy fresh sweet corn without having to eat it off the cob. 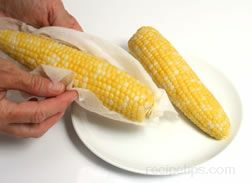 There may be times when you want to serve fresh sweet corn but feel it would be better not to have to serve it on the cob and serving creamed corn is a nice alternative. 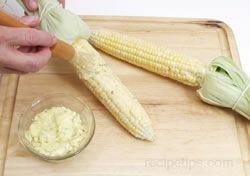 The steps below show how easy it is to make fresh creamed corn. 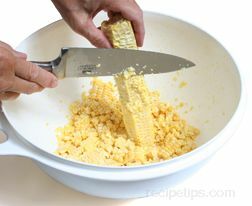 Cut the kernels off the cob into a deep sided bowl. This will help catch some of the corn as it splatters when trimming it off. Stand the cob on end, holding on to the stem end. 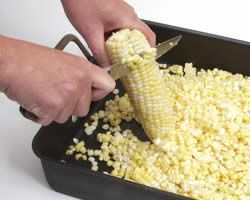 Using a sharp knife, slice down the side of the cob, cutting the kernels off. 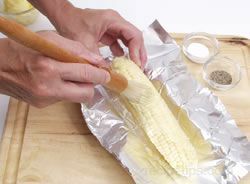 Rotate the cob after each slice and make another cut down the side of the cob. Repeat this procedure until all the kernels are cut off the cob. 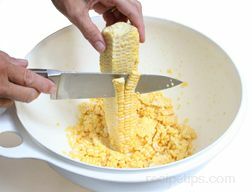 Then scrape down the sides of the cob with the back of the knife to remove any remaining pulp and milk from the cob. When all the ears are cleaned, set the bowl of corn aside. 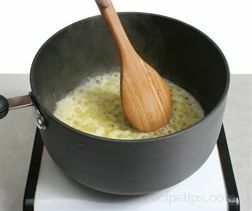 In a large saucepan melt the butter over medium high heat and then add the onions. Sauté the onions in the butter until they are soft and translucent. Add the corn and sugar. Stir to combine evenly. 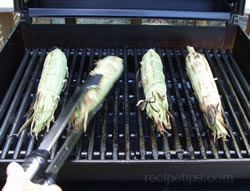 Cook over medium heat until hot and then allow the corn to cook another 3 to 5 minutes. Stir the corn often as it is cooking. 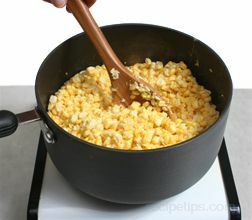 After the corn has cooked for 3 to 5 minutes, turn the heat to low and add 2 to 3 tablespoons of half and half to the corn. 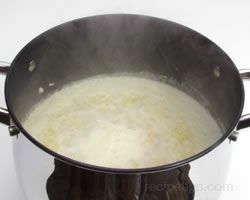 If the corn is still too dry, add 1 or 2 more tablespoons of half and half but be careful not to add too much. You do not want the corn to get soupy. 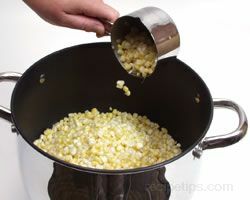 Add salt and pepper to desired taste and then bring the corn back to a simmer, cover, and allow it to cook another 5 to 6 minutes. Stir once or twice during this time. The corn should be tender when done. Serve immediately while hot or cover and turn the heat down to very low to keep it warm until ready to serve. 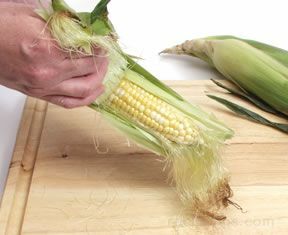 Remove kernels by standing the ear of corn upright on a cutting board or inside a pan that can be used to catch the corn as it is cut off. 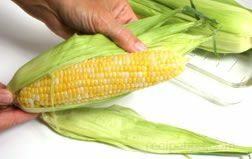 Using a sharp utility or chef's knife, cut the kernels straight down along the corn cob to free numerous rows of kernels at the same time. 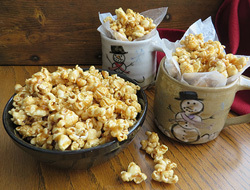 Measure out 14 cups of the cut kernels and pour them into a large pot. Add the sugar and salt to the corn. Pour in 7 cups of water. Adjust amount of water to just cover corn. Stir well to mix all ingredients together. Bring corn mixture to a boil. Boil 1-5 minutes to desired tenderness. Allow corn to cool. 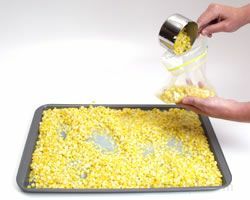 Spreading corn onto a large cookie sheet will cool the corn quicker. 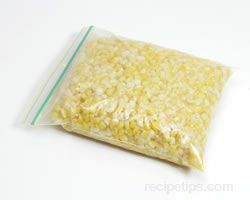 Scoop corn into plastic freezer bags, include a small amount of the remaining water mixture in each bag. Seal bags tightly and then flatten corn filled bag and place in freezer. Flattening the bags will allow them to stack neatly in the freezer. Tip: With a permanent marker, write the date the bag of corn was frozen for future reference. 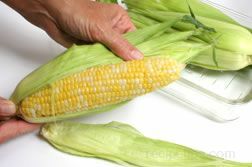 Sweet corn will lose its sweetness much faster if stored at room temperature compared to storing in the refrigerator. Do not husk before storing in the refrigerator. Husk just before preparing. It is best to eat it as soon as possible after it has been picked. "Gabriella, there are several different ways to freeze corn. Of course, everyone thinks their way is best. We have several recipes that will give you an alternative to what we show in our article. 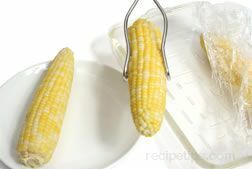 Here are the addresses for those recipes: http://www.recipetips.com/recipe-cards/t--5549/freezing-corn.asp, http://www.recipetips.com/recipe-cards/t--5551/sweet-corn.asp, http://www.recipetips.com/recipe-cards/t--121294/best-frozen-corn.asp, and http://www.recipetips.com/recipe-cards/t--160824/frozen-sweet-corn-not-precooked.asp. The last recipe is the one I use personally. We have been freezing corn with this recipe for years and we love it. We like the fact that you don't have to cook the corn when you are freezing it. You will have to take a look at these options and see which you feel will work best for you. Good luck!" 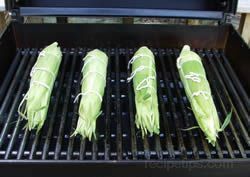 "I appreciate the information on freezing corn because I am going to try that this weekend. I have never frozen corn before. Are there any other ways of freezing corn?" 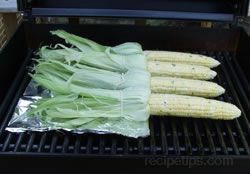 "I have never had grilled corn but I just bought a small grill and can't wait to try it out. 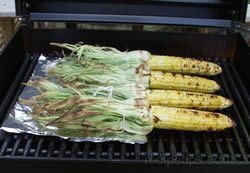 It was great finding this information on different ways of grilling sweet corn. I am going to give it a try this weekend." "I found it interesting to see all the suggestions for cooking corn on the cob. Especially in a skillet and the microwave because it is just my husband and I at home now and we only need 3 or 4 ears at a time for our meals. I am going to try both ways. Thanks for the information!" "I had some sweet corn to freeze but had never done it myself. I had helped my mom before but it had been a while ago. I found this information on freezing corn and used it. It seemed to turn out pretty good but we haven't had a chance to try it after it has been frozen. It will be nice to have it throughout the winter." "What a thorough article! It is that time of year and I always seem to boil my sweet corn, and for too long, too! I think I will try each of these ways and see what we like best. Thank you!" "Corn was delicious! My microwave is 1000 watts and I cooked 1 ear for 2 minutes.Butter, pepper and Marion-Kay seasoned salt - oh my..."
"I never go to all the trouble of removing the silks before microwaving in the husks. Here's what I do: 1. Cut off the stalk about an inch below the bottom of the cob. 2. Remove all husks whose bases were cut off (when you do this you will see what I mean). 3. 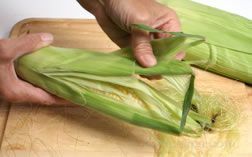 At the other end of the ear, cut the end off square across, so that you just barely cut off the tip of the cob and all the husk and silk flush. (again, easier to see when you do it.) 4. Microwave per your manual -- mine is 800 watts and I do 4-5 minutes per ear, depending on size. 5. 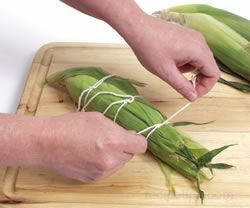 When corn is done, hold with a pot holder in one hand, and, with another pot holder, grab the husks and silks on one side at the tip of the ear and pull off (it tears off the stalk easier if you pull it at an angle when you get to the bottom). Repeat until all the husk and silk are off -- any few bits of silk can easily be picked off. 6. Cut off the stump of the stalk even with the bottom of the cob. 7. Add holders and seasoning of choice and chow down! Husking will take a bit of practice to perfect -- I can now do it in two passes per ear. Usually about 99-100% of the silks come off with the husks and any that remain are actually much easier to remove after cooking than when fresh."